Believe it or not, only three of the top 50 decentralized apps (dapps) are running on the Ethereum $ETH▼0.09% blockchain, according to data from DappRadar. Instead, developers seem to be largely relying on competing platforms like EOS and TRON.From the remaining 47 most active dapps, 26 are based on EOS and 21 on TRON. Interestingly, gambling dapps account for the majority of the activity on both networks. Among other things, the main reason for the decline in dapp activity on Ethereum is the scaling bottlenecks the platform has been facing. Ethereum, which was initially conceived as a platform for decentralized apps, has notoriously been dealing with scaling issues for some time now. Indeed, last year its co-founder Vitalik Buterin conceded that until the platform has a safe scaling mechanism in place, developers shouldn’t expect to run high-throughput apps on Ethereum. That said, Ethereum’s builder community has been working on possible scaling solutions for a while, but none of the propositions put forward seem to be production-ready at present.But in the meantime, EOS and TRON have claimed the lion’s share of the dapp market, which is still struggling to pick up steam among mainstream audiences. 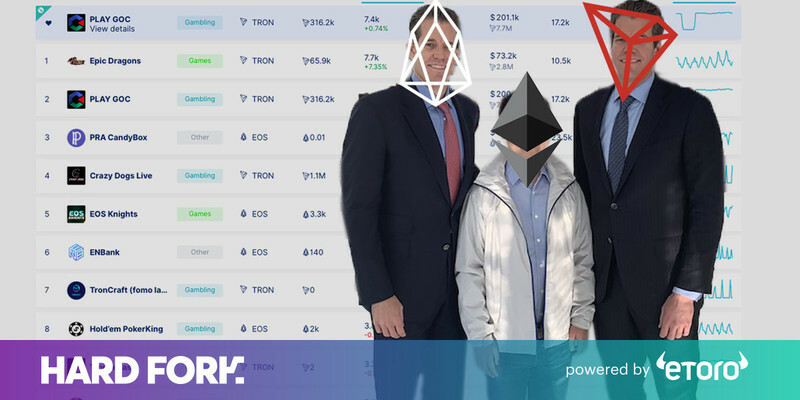 Currently, EOS and TRON are responsible for 94 percent of all monetary value transacted across all dapps, leaving Ethereum with a measly 6-percent chunk, according to data from blockchain research unit Diar. DappRadar, which once used to exclusively track app activity on the Ethereum network, recently introduced monitoring tools for EOS and TRON. Since then, apps running on those two platforms have steadily dominated DappRadar’s activity charts. There is a simple explanation to this conundrum: unlike Ethereum which supports up to 15-20 transactions per second, EOS is believed to handle up to 4,000 transactions per second (a claim widely disputed by Ethereum researchers) and TRON – up to 2,000. Of course, some would argue that comparing the transaction capacity of each platform doesn’t quite tell the full story. Buterin recently criticized blockchain projects boasting high transaction-per-second capabilities, downplaying such undertakings as “centralized piles of thrash. ” Although the Ethereum co-founder refrained from naming any projects, many interpreted his words as a dig at competitors like NEO, TRON, and EOS.“The purpose of a consensus algorithm is not to make a blockchain fast,” Buterin said at Blockchain Connect Conference recently. “The purpose of a consensus algorithm is to keep a blockchain safe.”“When a blockchain project claims ‘We can do 3,500 transactions per second because we have a different algorithm,’ what we really mean is ‘We are a centralized pile of trash because we only have seven nodes running the entire thing,'” he added. Buterin is not the only one levying such criticism against EOS and TRON. Indeed, researchers recently suggested that – in its current shape – EOS has more in common with a centralized cloud computing service than an actual blockchain. Not only that, the research claimed EOS had greatly exaggerated its throughput capacity.However, it’s worth noting the research in question was commissioned by ConsenSys, a company heavily invested in the Ethereum ecosystem. For the record, hackers have already had success exploiting kinks in EOS-based gambling dapps – on a number of occasions. But considering the sheer volume of vulnerability reports EOS has received over the past 12 months, this is hardly surprising. TRON has similarly fallen under fire for its gratuitous transaction-per-second marketing claims. In a recent interview with BreakerMag, former BitTorrent (a venture recently acquired by TRON) exec Simon Morris cast doubt on the platform’s advertised throughput capacity. Technical issues aside, the dapp market has mostly become a playground for hopeful cryptocurrency believers who are now stuck gambling their coins away. But hey, at least someone is using blockchain in the real world, right? Indeed, researchers found that 70 percent of all EOS dapp traffic comes from gambling services; the number was even higher for TRON, which gets 95 percent of its activity from gambling dapps. In the meantime, struggling corporations and fake prophets in suits continue to sell their utopian visions of how blockchain can fix everything.What a shame. Francisco Gimeno - BC Analyst Speed or safety? Where can we find the middle way, speed and safety? We believe these platforms have a lot of work ahed of them yet. They are, of course, the first working solutions in this field. even if it is mostly in gambling Dapps. Time will say.